Meitei Hindus of Manipur and others elsewhere in the world observe New Year or Cheiraoba every year sometime in mid April when the Sun enters the house of Aries or Mesha Rashi. This day is also called Mesha Sankranti (transmigration of the Sun into the house of Aries) by the Hindus. Mesha Sankranti is taken as the first day of the solar cycle year that is the solar New Year as per Hindu calendar based on the movement of the Sun. The day usually falls on 13 or 14 of April (sometimes 15 April) every year and take it as the first day of the first month of the year in many local and regional calendars of India and South-east Asia, that adopt solar calendar. The observation of Cheiraoba by Meiteis Hindus in Manipur is (apparently) in no way related with Charak Pujah, a Siva worship ritual of the Bengalis as suggested by some people. The nature of the ritual performed during Charak Pujah and that of Cheiraoba observed by the Meitei Hindus are quite different. During the festival of Charak Pujah, the human Charak is pierced with hooks called borshi on his back and then he is moved around with ropes fixed on a pole. Further, Charak Pujah takes place on the mid night of the last day of the month Chaitra/Choitro. However, preparation of the festival ( Charak Pujah) usually starts before one month of the Chaitra Sankranti that usually falls in the last week of March or first/second week of April. As per Bengali calendar, the month Chaitra/Choitro (March-April) is taken as the last month of the year whereas, the month Baishakh/Boishakh (April-May) is taken as the first month of the year. The name Sajibu Cheiraoba ( Sajibu New Year) practiced by the Meitei Hindus is adopted from the traditional Meitei word Sajibu (March /April), the first month of the traditional Meitei calendar and Cheiraoba, heralding of the approach of new year by holding a stick. It is also said that the date of observation of Cheiraoba by the Meitei Hindus is copied from the Bangali calendar after adoption of many of the Meiteis into Hinduism in the early part of eighteenth century and introduction of Goura Hinduism in the later period ( subject to further research). In fact, the people of Bengal too, observe New Year as Pohela Boishakh or Poila Baishakh, the first day of the month of Baishakh based on the movement of the Sun in relation with the Zodiac signs. As stated above, Baishakh (April/May) is the first month of a year as per Hindu Bengali calendar that adopts solar chart based on the movement of the Sun. Every year, the first day of Baishakh coincides with 13 or 14 (sometimes 15) in the mid April. As such, the Meitei Hindus of Manipur observe Cheiraoba almost in the manner and style of the traditional Manipuri Meiteis and the date is seemingly adopted from the solar calendar used by the Hindu Bengalis and certainly not from the date of observation of the Charak Pujah . Besides Meitei Hindus of Manipur, many non-Hindi speaking Indian states like Assam, Bengal, Kerala, Odisha, Tamil Nadu,Tripura, Punjab along with many other South-east Asian countries including Myanmar, Cambodia, Shri Lanka, Thailand, Laos, Bangladesh, some section of people living in Chittagong Hill Tracts and many other communities living in this region also celebrate New Year either on 13 or 14 April ( occasionally 15) every year as per local/regional astrological readings based on solar calendar. At some places the festival is observed for two to five days. 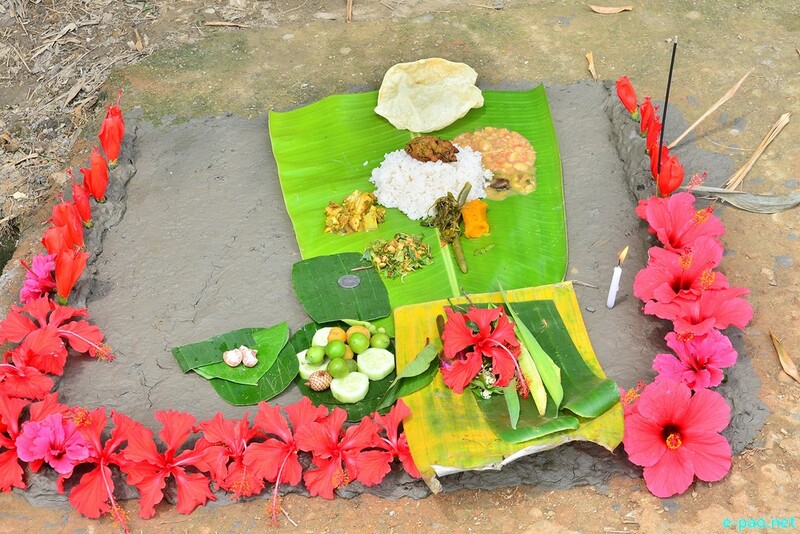 In Assam, the occasion is celebrated as Bohag or Rongali Bihu, in Bengal and Bangladesh as Poila Boishakh (Pohela Baishakh), in Tamil Nadu as Puthandu, in Kerala as Vishu, in Odisha as Pana Sankranti, in Tripura as Boisuk, in Punjab as Baishakhi or Baishakh, in Chittagong Hills as Sangrai by Marma people and Biju by Chakma people, in Myanmar as Thingyan, in Cambodia as Chaul Chnam Thmey, in Sri Lanka as Aluth Avurudda, in Thailand as Sonkran, in Laos as Bpee Mai/Sonkran or Songkran and so on. On the other hand, the month called Chaitra/Choitro (March-April) is taken as the first month of a year and Baishakh (April/May) as second month of the year as per traditional Hindu calendar based on the movement of the Moon. As per the lunar calendar, the first day of the first fortnight of waxing/brightening moon (Shukla Paksha) of the month of Chaitra is taken and observes as New Year. This year (2017) the New Year falls on 29th March whereas it was corresponded with 8th April last year (2016) as per calendars based on the movement of the Moon. As such, the first day of Sajibu which corresponds with the first day of Hindu month of Chaitra is taken as New Year by many communities who follow lunar calendar on the basis of their respective regional/local calculations. Mention may be made of Chaitra Navratris in Himachal Pradesh, Chhattisgarh and Jarkhand, Ugadi in Karnataka, Gudhi Padwa in Maharastra, Goa and Konkan, Sajibu Nongma Panba Cheiraoba in Manipur, Navreh in Kashmir, Thapna in Rajasthan etc. In many places throughout South-east Asia, the festival is also observed as an occasion for family re-unions, exchange of greetings, annual house cleaning, pouring of water, temple visits etc. Except for the water pouring part, other cultural practices performing in many parts of South-east Asia and that of Meitei Hindus are almost identical. Here it may be pertinent to mention that the Meiteis who practice and uphold the traditional/indigenous Meetei/Meitei religion, celebrate Cheiraoba on the first day of traditional Meitei Calendar Sajibu ( March/April) which generally falls on the last week of March or first/second week of April of the Gregorian Calendar. The traditional Meitei/Meetei Cheiraoba is believed to have been in practice since the time of Nongda Lairen Pakhangba who ruled Manipur in the first century AD. Generally speaking, lunar and lunisolar calendars were common in almost all the ancient countries of the world and still followed by many communities more for socio-cultural purposes. Lastly, it is a general practice among the Meitei Hindus of Manipur that after cleaning the house, a family meal/feast with variety of items comprising (at least) five or more is prepared with fresh seasonal vegetables and offered it to Yumlai and Lamlai and some people to Hindu Gods and Goddesses they worship at home too, before consuming it by the whole family jointly. After the meals are over, they use to climb a nearby hill considered to be the abode of Gods and Goddesses by the Meiteis. This tradition reminds the people of Manipur that the land (Manipur) comprises of both hills and valleys and our ancestors once lived in the hills, (though there are other explanations too). Thus, (Sajibu) Cheiraoba is celebrated in mid-April which usually falls on 13 or 14 April (sometimes 15) by the Meitei Hindus, mostly in local manner and style of the traditional (Sajibu) Nongma Panba Cheiraoba of the original Meitei/Meetei culture, along with many culturally identical people of South-east Asia, who adopt solar calendar. This article was posted on April 09, 2017.